Here’s what I had to say about it at the time. To summarize, I pointed out that the patterns we see are emergent, based on the relative lengths of the pendulum strings. They aren’t interacting with each other, but the fact that the lengths of the strings are mathematically related to each other creates the beautiful waveforms. In other words, despite there being no direct interaction, there is a kind of indirect relationship that is intriguing. A similar insight led Max Planck and Albert Einstein to the beginnings of quantum mechanics; in this post, I’ll start from a modern understanding of quantum oscillators and work backwards to show how these pendulum waves connect to all sorts of interesting phenomena. Two equivalent positions for the nitrogen atom (labeled N) in an ammonia molecule. The hydrogen atoms (marked H) are in the same places in both images. An ammonia molecule is a simple quantum mechanical oscillator that looks kind of like a pendulum if you use a bit of imagination. As the figure shows, ammonia consists of three hydrogen atoms arranged in an equilateral triangle, with a nitrogen atom making a total pyramid shape. This molecule appears to be somewhat asymmetric, though! There’s no real reason to draw the nitrogen “on top” of the pyramid rather than “below” the hydrogen atoms — it’s like having the pendulum bob on the “left side” vs. the “right side”. Those two positions of the nitrogen atom or pendulum bob are energetically equivalent: they represent the same physical state. Enter Emmy Noether and her theorem: if there is a symmetry in energy between two states, there must be a symmetry in time too. That’s the fancy way to put it; the simple version is that there has to be oscillation! Just as a pendulum swings back and forth, the nitrogen atom must move back and forth from the “above” to “below” the triangle of hydrogen atoms. In fact, it is impossible for the nitrogen atom to stay in one place without an outside influence, even though there is an energy barrier at the location of the hydrogen triangle — the nitrogen atom must tunnel through to complete its oscillation. (Tunneling is of course an interesting phenomenon in its own right, which I will leave for another day. Here’s a fun 1-minute explanation.) A major difference between the ammonia molecule and a pendulum is that the pendulum swings because of gravity; the ammonia molecule will oscillate entirely on its own. 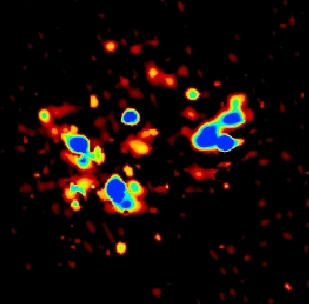 A radio image of a water maser in a star-forming region. The image is from the Jodrell Bank Observatory. Of course you can force the nitrogen atom to prefer one position over the other, in the same way you can put an external force onto a pendulum. If you put electrical pulses through a bunch of ammonia gas, you can stimulate transitions, forcing the molecules to emit photons of a particular frequency in the microwave part of the spectrum. This system is called a maser: microwave amplification by the stimulated emission of radiation — the microwave version of a laser. Charles Townes, J. P. Gordon, and H. J. Zeiger built the first ammonia maser in 1953; masers from other molecules have been found in interstellar gas clouds. The allowed energy levels for a quantum oscillator, which are determined mathematically by the parabolic curve shown. 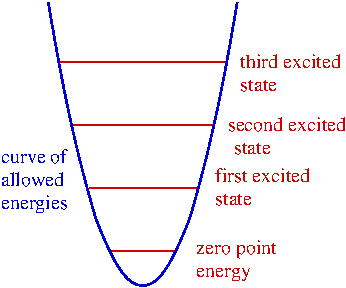 Note the lowest energy level is the zero point energy mentioned in the text. In general, quantum oscillators can only have certain specific internal energy values. After all is what makes them quantum: they can only absorb and emit certain quantities of energy. As we saw with the ammonia molecule, even when left alone a quantum oscillator will fluctuate at a specific energy, which goes under the fancy name of zero point energy. (In the Pixar film The Incredibles, the villain Syndrome uses zero point energy to fling the heroes around effortlessly, which is obviously a bit of license on the screenwriters’ part.) Quantum oscillators come in many forms, from simple molecules to crystalline solids. The Einstein model of a solid is based on a big lattice of independent quantum oscillators… and here’s where we get back to that wonderful pendulum video at the beginning of the post. Each oscillator in the solid is identical, in the sense that each one has the same set of energy levels and zero point energy. This means that when any oscillator transitions from one energy level to another, it will emit or absorb the same amount of energy as any other in the solid. Even though the oscillators don’t interact with each other directly, because they have the same energy levels they will act in concert under the right conditions, just as the pendulums’ lengths in the video are related to each other, so they create patterns. Thermal spectra for four different objects, whose temperatures are fairly typical for stars. Our Sun is most like the curve in green. The pattern created by oscillators in the Einstein model is one of light, since the energy absorbed and emitted is in the form of photons, and the details depend on the temperature. Temperature is a measure of average kinetic energy — the energy of motion — so the higher the temperature, the more energy is available to put into the oscillators. As a result, an interesting pattern of light emerges, known as the thermal spectrum. As I wrote in an earlier post about why there are no green stars, hotter objects emit more light than cooler objects, again because there is more energy available to the oscillators that create photons. We’ve come a long way from a weight on the end of a string, but so many of the basic concepts are the same. Oscillators are some of the most important objects in all of physics, tying together ideas you learned in elementary school to cutting-edge research in theoretical physics, biology, networks, and so on. Galileo’s pendulum may have been the starting point, but we are hardly finished with understanding oscillators. Expect more in weeks to come!